The holiday season is almost upon us. Thanksgiving, Advent, Christmas. We will cook, decorate, gather with family and friends. It's time for preparation, festivities, fun. We talked, in our last post, about our call to be heroes of the faith in our everyday lives. I cannot think of a better season than this one for everyday heroism. There is much to do in little time with little money. Some of us are surrounded by so many people that we want to run away to a quiet room. For others, the loneliness of yet another holiday can stab with the force of a sword. In all of it, there are chances for heroism. I can offer up busyness or loneliness as prayer. I can complain about all this cooking and all this wrapping, or I can bring peace to others by simply keeping my mouth shut (for some of us, silence can be truly heroic). The season is almost upon us. Let the Holiday Heroics begin. You have said everything so well. This can be a stressful and busy time of year. I hope I can remember to do everything with love rather than complain. It must be an even busier time for you with Thanksgiving to celebrate. I like the painting. 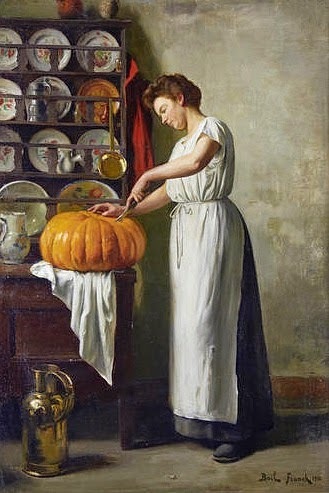 I don't think I've ever seen a painting featuring a pumpkin before! Thank you so much, Sue. Yes, over here Thanksgiving is the basic kick-off to the whole festive season. It tends to be a very busy time all on its own, with days of meal-preparation, and more people fly in the US for Thanksgiving than for Christmas... which I personally find amazing! The day after Thanksgiving is a huge shopping day (when some of us hide away and don't venture out our doors!). So it all sort of runs together. I like that painting too, and was glad to have a chance to share it here. I think the pumpkin looks so real! Beautiful, Nancy. I am inspired to be heroic now! Thanks so much, Trish. I think I missed an opportunity for heroism yesterday.... but I have another chance coming up :) !